We’re thrilled to review the wonderful Husqvarna Toy Walk Lawn Mower for kids 2 to 5 years old. The designers have truly created a timeless toy lawn mower that kids will absolutely love. It’s very well made and looks fantastic, not to mention the great interactive touches they’ve incorporated into the toy. Husqvarna is a brand synonymous with quality. Everything they design is exceptional, and in this article, we’re going to delve into this delightful Husqvarna toy lawn mower which is based on the the Husqvarna HU800AWD AWD lawn mower. We’ll discuss both in this article. A wonderful gift idea anytime of year. For use indoor or outdoors. This toy is for boys or girls. This Husqvarna toy lawn mower is the perfect antidote to get your child up and away from digital screens and off of their butts. Let’s face it, far too many kids spend their time in front of a screen of some kind. I think as a parent it’s imperative that you find new ways to captivate the imagination of your child and get them moving in the real world. This lawn mower toy from Husqvarna will do exactly that — winter, spring, summer or fall. Perfect for use inside or outside. I think that Husqvarna has done a great job in creating a tactile toy that invites kids to play through movement, which is essential to their development. Modeled after the Husqvarna HU800AWD. Large wheels make it easy to push and move around. Realistic engine sounds and animated lights bring this toy mower to life. For ages 2 to 5 years old. Sturdy design means it can take the playful abuse that kids can dish out. Bold and beautiful design is sure to be popular with children. Has a “Try Me” feature for demo purposes. We’ll discuss all the details throughout this article along with other important facts to help you decide if this is the right product for you. Most people are familiar with the name Husqvarna when it comes to quality products for the lawn and garden. It’s a name that typically stands for durability, well-built products that deliver great performance for the many tasks around the home. They also make quality products for kids too! This Christmas season, the release of the new Husqvarna toy walk lawn mower is available for the budding landscaper that is eager to get out in the yard. Toy lawn mowers are nothing new to parents and children, but you haven’t seen one quite like this one. The Husqvarna Toy Walk Lawn Mower (589 28 96-01) is not your average toy. It was designed and modeled off of the actual model Husqvarna HU800AWD mower! Every little attention to detail went into this toy to mimic the real deal so your handy helper can get the feel of the experience in mowing the lawn. The lights and sound truly draw you in and complete the experience. Yard work is not always something that is easy to let children lend a hand in due to the dangers around working with power equipment. This model toy lawn mower is as close to the real deal as you can get for a better, safer way for children to learn about lawn care. Your child will be so excited to have their very own mower with actual engine sounds and lights. It has many of the same physical attributes as the real model so children will feel as though they are pushing an actual mower and not just another toy. Children love to imitate what they see and that holds true when it comes to everyday tasks like cleaning and yard work. It’s how they learn about the way the world works. Being able to take part in ‘grown up’ chores often gives children a sense of pride and confidence as they develop their independence. This way of pretend play and role playing is an essential part in your child’s development as they learn real life skills. Providing opportunities for them to help and learn new things is also a great way to instill self-confidence and responsibility. The Husqvarna toy walk lawn mower features an on/off switch so your child can start up the ‘engine’ as they get ready to tackle the yard. Apart from a real engine and actual blades, this little lawn mower was made to function more like an actual lawn mower than a toy. The treading on the tires provides easy ‘all-wheel drive’ for better traction so your little lawn keeper can easily push the mower through the grass. The beauty of this toy is that it works as a catalyst to get kids up and moving. Just like the actual HU800AWDH lawn mower model, the rear wheels are slightly larger than the front wheels. 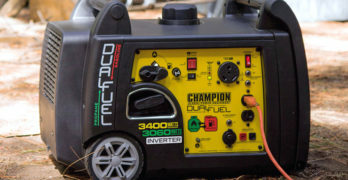 This makes it easier to push the mower with over various terrains unlike common toys that are ideal on flat surfaces only. The ‘life-like’ features that have been modeled into this toy are exciting for little ones to see as having a mower just like their mom or dad but on a smaller scale that is just right for them. When you’re looking at a product, it’s quite common for consumers to want to try them out first. Sometimes you just need to get a feel for something before you venture out to buy it to ensure you are getting the one that’s right for you. The Husqvarna toy walk lawn mower has a ‘Try Me’ feature so your child can get a real sense of what it sounds like and imagine themselves pushing it around the yard. Another important aspect that sets this toy walk lawn mower apart from the rest is the quality in it. This doesn’t come as a major shock considering this is a reputable company that takes pride in delivering top notch quality products in lawn care. It’s no different in their products manufactured for the earliest of lawn-keepers. The toy walk lawn mower looks and sounds like the real thing and likewise built to last. Kids can be tough on toys, especially when taken outdoors and left in the elements. This is one that will stand up to the test your little yard worker will put it through. Great build quality, beautiful styling and pure innocent fun. The toy mower is recommended for children between the ages of 2 and 5. Young tots learning to walk can also benefit greatly from this walk-behind toy to help encourage their gross motor skills. An ergonomic handle was also incorporated into the toy from the actual model to provide a more natural and comfortable grasp for little walkers to push. It’s a versatile toy that can serve as a support for early walkers as well as a fun and unique toy they can grow into. Your budding professional won’t have to worry about the regular maintenance that comes with power equipment just yet, but you can still show them how to care for their equipment. The lawn mower is easy to wipe clean and your tidy tot can even store it away in the garage with the real model until the next time they take to the yard or take it inside. The toy lawn mower requires 3 AA batteries for the engine sounds and lights. Another great Husqvarna toy that kids also love to play with. Yes, it’s safe to use. The lawn mower isn’t the only toy that the manufacturer has designed in likeness to the real deal. There’s an entire toy line of the same power tools you find in many garages including a Husqvarna weed trimmer and hedge trimmer that would pair up nicely with this lawn mower to round up the job of yard work. There’s also a toy chainsaw and a Husqvarna toy leaf blower! Their exclusive line of toy products were designed to look and feel much like their real counterparts to provide fun and educational products that let your child take part in keeping the yard looking neat and tidy. Much like the professionals, your child can learn and carry out each step in the process of lawn care and maintenance from grass cutting to leaf blowing. It’s a great way to teach them a valuable skill they will use later on in life and carry down to their own children. They also provide an excellent opportunity for valuable family bonding while tending to the outdoor chores. Practical AWD system provides balance and power to all four wheels. Honda GCV190 : 190cc 4-cycle engine. 3-in-1 cutting system : Collection, mulching for lawn fertilization and ejection. All-wheel drive : Simultaneous power to all 4 wheels so you can mow all types of terrain. 12″ high rear wheels. Ideal for small to medium sized yards with hilly, uneven terrain. Premium crown-cut blade outperforms standard blades in bagging, mulching and side discharge while creating smaller clippings. Dual Trigger Drive activation gives you the option to use the variable speed control with either hand. Deck Wash : Connect a garden hose to easily clean the underside of your mower deck. The Husqvarna HU800AWDH walk behind mower is the inspiration behind the toy. The AWD mower was designed to make yard work a breeze. It is equipped with a high-spec engine manufactured by Honda to deliver power and efficiency. This power walk behind mower has some serious power to tackle thick, stubborn grass, yet is so easy to push and maneuver you might think it really is a toy. The 3-in-1 bagging system gives you multiple options so you can choose to side discharge, collect the grass clippings, and mulch without the need to buy additional parts. The adjustable handle and ergonomic design make it easy for anyone to handle. The all wheel 4×4 drive is a factor that is exclusive to Husqvarna products to provide easier maneuverability. You’ll see this in the toy walk lawn mower as well with the detail to the tires and the iconic brand stickers placed. The self-propelled system featured in this model is another feature that makes this an ideal mower for different types of users as you take can take control of your own mowing pace. Clear the yard of debris. Before you get ready to cut the yard be sure to clear the lawn of debris such as twigs, sticks, rocks, and toys that can get caught in your lawn mower’s blades and thrown. Do Not continue mowing if you hit an object. Once you’ve cleared your yard of debris there may still be hidden dangers in the grass. Watch out for objects while you’re mowing, especially as you turn corners and mowing around trees and bushes. If you hear the mower strike something you should stop and turn off the engine immediately. Be sure to inspect the mower for any signs of damage before turning it back on and have necessary repairs done before resuming to use the mower. Be sure everything on your mower is in proper place. The HU800AWDH walk behind mower has a 3-in-1 feature to allow versatile cutting options. The collection bag can collect grass clippings to turn into nutritious mulch to feed back into your lawn. It can also provide a safeguard from dangerous projectiles that might have been missed when clearing the yard. Be sure to refer to the user manual of your lawn mower to ensure all protective guards, shields, and grass collector are properly secured for optimal safety. Keep your child in sight. This may seem like a no-brainer, but when your child is outside having fun, it’s easy to lose sight of them. This is especially true when you are doing something like yard work. Always know where your child is while operating the lawn mower to ensure they are a safe distance. Children can get carried away while enjoying some outdoor bonding time with mom or dad and often run into the mower’s path, which can be very dangerous. Discuss the importance and dangers of power equipment and what could happen so that they know and understand where they should be while ‘cutting’ the yard with their toy walk lawn mower. Know your mower. Be sure to read the user manual before operating your powered lawn mower so that you are familiar with it and know how to operate it fully. An important function is knowing how to stop the mower quickly if you need to cut it off due to an obstruction or other safety hazard. Additionally, you’ll want to read up on safety recommendations including maintenance to ensure your mower is running in top shape and safe to operate. The Husqvarna toy walk lawn mower was modeled after Husqvarna’s HU800AWDH Walk Behind Mower to provide your child with a lawn mower all their own. Never allow your child to operate power equipment alone or ride on riding mowers. Be mindful of where your child is while mowing the lawn and ensure they are a safe distance from the machine to prevent injury. The Husqvarna toy mower is a great learning opportunity to show and teach your child about safety from early on when it comes to doing yard work so when they do become of age to operate one they will know how to get the job done. 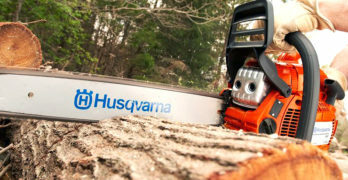 ✓ Visit the Husqvarna site to learn more about these toys and see their full range of power equipment and tools.